Baby Watch 2010 has officially kicked off. 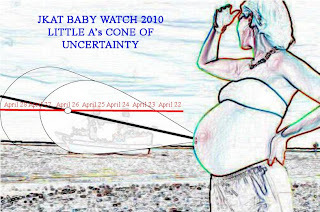 With a due date of April 26th Southwest Floridians, or at least those who will be affected by Hurricane Little A, are closely monitoring any and all activity related to her birth. The National Baby Watch Service has issued the following advisory. :) This makes me sooo happy! I'm all for being excited but your pencil sketching of pictures is getting slightly out of hand bud! Do you own that tuxedo, or is it a rental? Physiologically impossible, I think not.